How to look after your leather. Do you need to condition leather? Can I over do it? 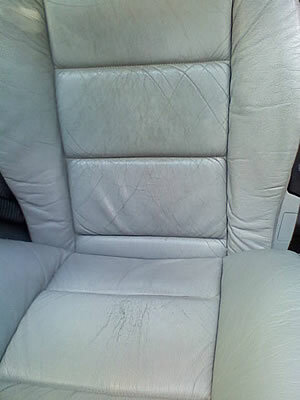 Leather upholstery does require some maintenance, it also requires more care than fabric. Even though it can be more hard wearing than fabric upholstery, it is in some ways more delicate and particularly prone to certain kinds of damage. In this article I'll run through a maintenance regime, provide some tips as well as pointing out some dangers. All the photos on this page were sent to us via 'Ask the Experts'. The first thing I would recommend doing is getting a travel blanket. We always recommend having one in your car anyway, but being able to throw one over your back seat so that you can save your leather will pay you back dividends. Although this seat would benefit from recolouring, you'd be surprised just how much a good clean would freshen it up. Regular conditioning would have reduced creases and helped it stay fresh. The next thing to get is some proper leather care products. You don't need to use them right away, there is no need to clean or condition the leather on a new car, but it may be as well to get them at the beginning anyway. 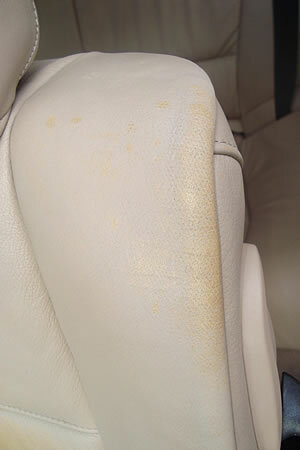 Only use products designed for leather in cars... don't ever improvise with household products or home remedies. It's just not worth taking the risk because the purpose made products don't cost the earth, but rectifying problems with leather can be very expensive. Having said that, not all the leather care products designed for cars are all that great, some are very oily and leave your leather with a cold greasy feel. So it's best to stick to trusted brands. 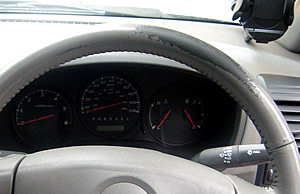 There is a tendency for some manufacturers to sell general use products, for example they may have a dashboard dressing, but they will also tell you it can be used on leather. The problem with may dressings is that that they may look good when you first put them on, but after a while they look patchy and uneven, or leave sticky residue. There are three main kinds of product we recommend: Leather cleaner, leather conditioner, and an 'Ink Stick' which is a tube which looks much like a PrittStick, but which is an ink and stain remover, several companies make something like this. Of course to confuse the matter, there are products available which are combined cleaners and conditioners. If asked to recommend a product, we would suggest the Supagard Leather Kit. Supagard is best known for their paint sealants, but they also sell this kit which has their name on it, but we are pretty sure the kit is actually produced by one of the worlds most famous leather hide suppliers. It comes in a kit form, in a handy box, with everything you need making it the perfect solution. 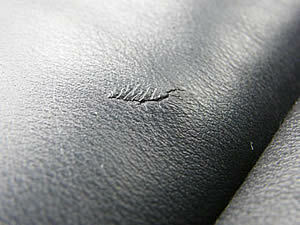 Some creases are inevitable on leather, but unless the leather is kept supple with a conditioner they turn to cracks. We also recommend the AutoSmart products. The leather cleaner is used by us both when valeting and when connollising. Darrel, our leather expert claims it is the best cleaner on the market. The Leather conditioner is also very good and easy to use with no mess and it does leave a great finish -- there is a tendency for some products to be too shiny but this leaves you with your original satin finish. More easily available to the general public are the AutoGlym products which are superb as always. Whatever Leather products you use, we recommend that you follow the instructions if they come with them -- what they often don't tell you, and what we often get asked is how often to use them? We would recommend using the leather cleaner 3-4 times a year, or as often as needed. If your leather looks dirty, then use it any time. As for the conditioner (cream or barrier), we would suggest a general rule of using it once per year, or twice a year on convertible cars. It's probably best to do this in the spring so that the leather becomes hydrated before the summer sun can get to it. Do you need to condition your leather? Yes and no. There is an argument than the leather on many cars is painted and/or laminated with plastic, so you can rub conditioner onto it as much as you want, but it will never get to the leather! Although this may be true on some cars, it won't do any harm to condition them. Yes, apparently you can. I once talked to a chap who had been poorly advised and conditioned his leather every time he cleaned his car. His seats ended up a rotting sticky mess. This probably started out as damage from a seatbelt and just got worse. Jeans - The blue dye in jeans can leach into leather can cause permanent stains (This is also true of some other clothing). If you find that your clothing is causing stains, you will have to attempt to clean off the stains and stop wearing those cloths in the car. Some jeans have rivets and studs on them, these can cause scratches and even rips to leather. I'm afraid that leather upholstery just doesn't suit people who like trendy cloths! Hair Gel - Hair gel and pomade which has soaked into the headrests of cars is a problem we used to see quite often, it's been on the decline as wet look hair gels have gone out of fashion, but it is a danger you should be aware of. 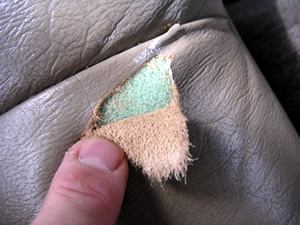 It can sometimes be removed, but many gels contain blue or green dye which once it has got into the seat can be impossible to remove. Sun tan lotion & fake tan - This isn't such a common problem, but if it happens it can be a disaster! This is where you can use that travel blanket to save your leather. Unfortunately, many lotions are designed to soak into skin -- and leather is skin. Once they get in, there is no getting them out again. The only repair option is to have a coach trimmer replace the affected leather panels. 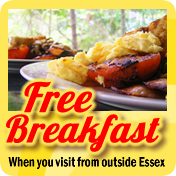 Children and pets - Anybody with children knows they will make a mess and will have had experience of ice cream, crisps and fast food all over the back seat. So they think leather will be a good option as it's easy to wipe down - which is true but greasy food can still stain leather as can Ribena and the like. There are some downsides, if you fit child seats they tend to stay in for a long time and can imprint their shape permanently into the leather. Children will also crawl around on the seats and scrape the leather with buttons and buckles, not to mention the free toys you get from fast food restaurants (We have seen thousands of these in cars over the years). The other danger from very young children is from pens and crayons, if they get hold of them they will use them and although sometimes they can be removed, some can't. Dogs don't wear seatbelts and often have real problems with balance in a moving vehicle, so they tend to dig their claws in to get a grip, the results are predictable. Shopping - Anything you buy is best off in the boot of your car but some items won't fit. If you absolutely must put stuff on the back seat, then wrap it in the blanket we told you about earlier. If you can, get it wrapped in the shop so that any sharp edges are covered. For some reason, we have repaired a number of seats that have damaged by picture frames, but this advice applies to just about anything. Rain & Water - Another problem we occasionally see is from rain water getting onto the leather because a roof has been left down or a window left open. There isn't much advice we can give about avoiding this, but you should be aware that it can cause damage to the finish, or in extreme cases where the water isn't allowed to dry out, it can cause rotting, mould, mildew and odours... so try and avoid it and if you do get wet, try and dry the car as best you can. A property of leather that doesn't suit upholstery is that when it gets wet, it can shrink and go hard as it dries. So if you find water on, or soaked into your seats, dab it with a towel and then use your leather conditioner to re-moisten the area. It's important to do this before it dries out, so it's worth carrying some leather conditioner in your boot along with your blanket, especially if you have a convertible. Getting into a car with wet clothes isn't usually much of a problem but if for some reason you end up sopping wet, you can utilise that blanket that you keep in the boot of your car thanks to our advice! Seat Belts - Just try to be aware of where your seat belt buckle is when closing your door. They the door can catch them and punch them through the side of your seat... but it can also damage the door, door shuts or door card. It does happen! General Wear -- Without a doubt the most common problem but easy to fix if caught early enough. General wear on the drivers seat is the number one reason our customers contact us. 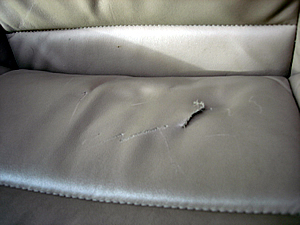 This can happen on a car as young as 6 months old, it all depends on how much you use the car and the quality of the leather. If it is a problem you are getting, then unfortunately there isn't too much you can do about it. Generally it's caused when you climb in and out of the car and you rub against the right hand bolster and the leading edge of the base of the seat. You can slow the effect by climbing into your seat carefully and keeping the area conditioned so that it isn't allowed to get really dry. Once you start to get wear in these areas we recommend that you have the areas connollised before it gets too bad. Aside from covering any wear marks, you are actually adding thickness to the surface which can act as a sacrificial layer for the future. But the main reason for getting it recoloured is that the more wear you get, the faster it wears. The bare leather dries and cracks. Leather is fibrous and as the cracks keep bending the leather weakens making a replacement leather panel the only option, which can be comparatively expensive, and takes longer to repair. As already mentioned, the quality of the leather will effect the rate of wear. Very good leather is thick and durable, very cheap leather is often laminated and can also be very hardwearing. It's the mid range leather that can suffer. Very soft leather is also prone to the problem. So it's wise to learn from experience, if you have a car with a leather interior and you do get this wear problem, it would be a good idea when buying your next car to look for a more durable leather or go for cloth seats. Alcantara is something you should take special care of, it's hard to repair, and expensive to replace. We recommend that you clean it with a damp microfibre cloth and/or suede brush. Do not use harsh cleaners and don't try to condition it! 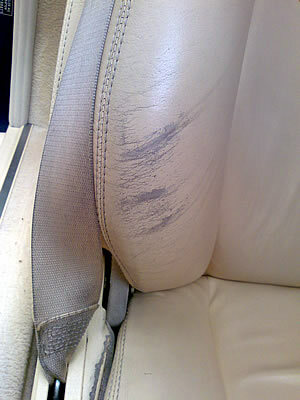 This seat has recently been recoloured with substandard materials and as you can clearly see it's all coming off again. Indulge me for a moment, I wanna tell you a story. When I first came to this company we were mostly doing valeting and I was involved in documenting valeting procedure for instruction manuals. And of course, whenever a problem arose, I had to try and put new procedures in place to try and make sure the problem didn't happen again. The first serious problem I came across was with leather repairs. 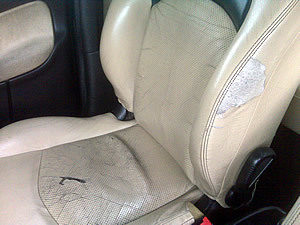 A customer would come to us and as part of their valet we would be asked to condition and/or clean the leather. One of our valeters would get to work with a cleaner, they would be working away and all of a sudden they found all the colour was coming of a seat to reveal a repair! To cut a long story short, in most cases we worked out that while these cars had been with the dealers they had called in a Smart Repair guy to do a repair. And the materials they used just weren't any good... so much so that they could be wiped off with a leather cleaner. This situation arose about three times a year for a while. To fix this situation, we wanted these areas re-repaired, but done properly so that it wouldn't wipe off. We also wanted the repair to be a good colour match, good texture match, we didn't want it to fade, or to peel off -- these were all problems we have seen with alarming frequency! So I set out to do some homework and I found that at the time, the only sure fire way to repair leather was with Connollising. That is using the exact same technique used by the Connolly leather company which had supplied the leather to Aston-Martin, Jaguar, and Rolls-Royce for many years. Even though the Connolly Leather company has long since gone, there were a few former employees still doing repairs with the original materials. That was a few years ago, the materials used by the manufacturers have changed but we still insist that when we have repairs done, OEM inks are used. I can honestly say that the materials we use now are far more durable than original Connolly materials, that's why we are able to give a guarantee. However, some of those old problematic materials are still on the market, especially in kit form. 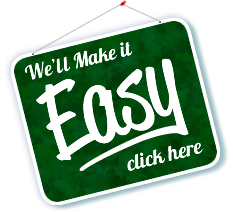 Unfortunately it's fairly common for people to come to us asking us to rectify bad repairs. The biggest problem is colour that comes off, sometimes it peels off making a terrible mess. Colour matching is also something that's difficult to get right... it's an art! Darrel, Geoff and Alan all mix their colours by eye from a base to which they add tints. Leather will fade and change colour and so it is impossible to get the right colour out of a bottle because your leather won't be exactly the same colour now as it came out of the factory. Very few people really want the whole interior re-done when most of it is still good, so the trick is to not make the new area not look too new -- this is also an art. So now you know, only yesterday I got an email from somebody asking me to recommend a kit, I don't recommend kits. They are expensive and there is no guarantee they will stay on even if the leather surface is properly prepared which few people are equipped to do. And you can't get a colour match even on black. To sum up, if you are going to have repairs done to leather, the right way is the only way. 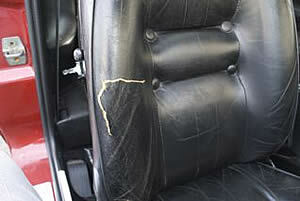 A leather repair can be quite expensive... but not nearly as expensive as a bad leather repair! Old vinyl can become cracked. 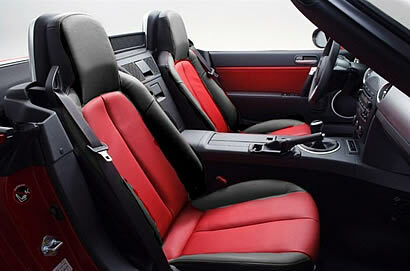 It's not generally known but very little of your leather interior is likely to be leather. The faces of your seat will be, but the sides and backs are likely to be made from imitation leather. This has different problems, it can't be conditioned and if exposed to lots of sun and heat it can split and crack. Vinyl can be repaired quite easily in many cases. 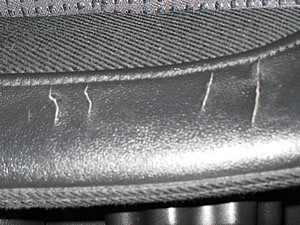 As it's usually on the backs of seats (non-wear areas) a patch can be glued from behind to strengthen it, and then the crack filled with a flexible filler and recoloured. Otherwise the panel can be replaced by a coach trimmer. The key is to get it seen to quickly as any cracks and splits will tend to get bigger so 'nip it in the bud'. Stitching coming apart, a job for a trimmer. 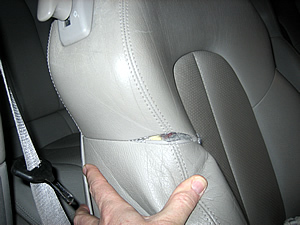 Stitching can also be a problem on some design of seat. Namely when the stitching is in a wear area and stands proud. Unfortunately there is little can be done other than to nurse the area and try to avoid wear. The good news is that this stitching is usually decorative and if it wears away it doesn't always mean that the seams will come apart. The only way to rectify worn stitching is for a trimmer to take the seat apart and stitch it back together again. Piping can get a lot of wear on the lead edge of seats and on the bolster. What we sometimes see on older cars is that the leather used for the main part of the seat is thick and strong and has stood up to years of wear, but the piping uses a softer leather and gets extra wear because it stands proud. If you catch any holes on the piping early enough, reconstructive surgery can be performed to put it right. Otherwise the solution is to have a trimmer fully replace the piping. Sunken Seats - Some cars are prone to this. There isn't much can be done about it other than to have a trimmer re-stuff the seat. With the raw leather exposed it will draw moisture from your hands - acid and oils from your skin will accelerate the deterioration of the surface. Leather steering wheels are a real pain if you get a problem. The acidity of the skin of the driver seems to have a lot to do with it -- some people wear steering wheels out more than others. If you do find your steering wheel wearing, We would recommend cleaning and conditioning it more regularly. Once again, don't let the problem go too far as we can recolour a steering wheel with wear, putting a good thick coat of especially durable colour on it. But if the leather becomes too far worn, then it can become costly. Very few coach trimmers will tackle them as it's an amazingly difficult job to recover a steering wheel, and replacements from the manufacturer tend to be very expensive. Quite a mess, but nothing a coach trimmer can't put right. Special textures and patterns. 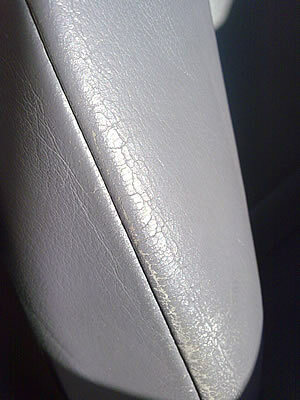 Some panels in your leather seats may have an unusual pattern, usually holes for heated seats. This makes the job of repair or replacement very difficult. Once again, it's very important to see an expert at the first sign of a problem, it will give them more options. I have mentioned coach trimmers many times throughout this article as their talents are invaluable in rectifying leather upholstery. There is very little they can't do, most could completely replace all the leather in your car if you wanted them to, but it all comes down to cost. Seats these days aren't just seats, they are packed full of motors, sensors, heaters and switches. A trimmer needs to take a seat apart to repair it and on some vehicles this can be the bulk of the job and a large part of the expense. The next expense it the materials -- Vinyl is not expensive but leather can be. A coach trimmer will buy hides which he cuts to replace damaged panels. The good news is that they will buy good quality hides and in many cases, the leather they use will be less processed, better quality and more durable than what you started with. All the photos on this page were sent to us via 'Ask the Experts'. If you have specific problems or further questions, please feel free to ask, after all it is free to use. Coach Trimmers in the Luton area.